Palmitas is a small, densely-populated neighborhood in the city of Pachuca, the capital of the state of Hidalgo in central Mexico. It has a reputation for higher than average levels of deprivation, crime and violence. 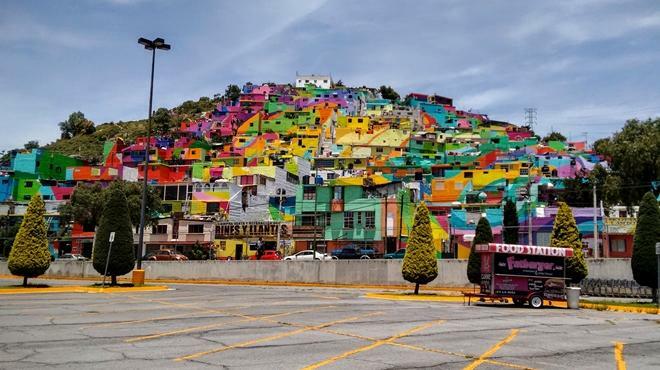 An innovative social development project, based on artistic transformation, has turned Palmitas over the past few months into a rainbow-hued, quasi-kaleidoscopic, example of urban renewal. The project involved four main players: an art collective (“Germen Crew”), the city government, Comex (a major national paint manufacturer) and a youth organization that was previously better known for its graffiti art. The youths joined “Germen Crew” and painted 209 houses, some 20,000 square meters of facade in total, into a single rainbow mural. The specialized materials used, supplied by Comex, have provided maximum long-term protection for the dwellings while turning the streets into ribbons of color. The greatest challenge was that many of the exterior walls were in a very rough shape, and some had never been properly finished or protected. The “macro mural” has been called the “world’s largest” in some news reports. This title is hotly disputed; other contenders include a mural in Berlin and the Pueblo Levee Project in Colorado. According to streetartnews, the community involvement in this project from start to finish, led to positive effects on 452 families (1808 people), and a dramatic fall in youth violence, to the point of almost eradicating it. Alongside the months of paintings, numerous community events were held to foment participation and a sense of local ownership of the project. The colorful Palmitas project is an unusual and interesting example of urban improvement, urban renewal or urban regeneration. Comex has said that it will support similar urban renewal projects elsewhere in Mexico that beautify the local settings and help improve people’s lives, so please report back if you find a similar project happening in your neighborhood. The Trans-Isthmus mega-project Mexico’s tourism development policies: a model for the world?